You might not often see it in in your local grocery store, but cow brain has been consumed in America since at least the early 1900s, according to "The Boston Cooking-School Cook Book." The brains -- which can be eaten sauteed, pan-fried or boiled -- come packed with nutrients and help you consume more minerals, vitamins, protein and healthy fat. Beef brain also has some nutritional drawbacks, however, and in some cases might pose a serious health risk. Beef brain offers nutritional value thanks in part to its protein and healthy fat content. Each 4-ounce portion of beef brain contains 12.3 grams of protein -- approximately one-fifth of the recommended protein intake for an average 150-pound person, according to the Iowa State University Extension. This protein helps your body maintain healthy muscles and also plays a role in immune function. Beef brain also contains docosahexaenoic acid, or DHA -- a type of omega-3 fatty acid. Omega-3 fatty acids reduce your risk of cardiovascular disease, and they also promote healthy brain function. Each 4-ounce portion of beef brain contains approximately 1 gram of DHA. Beef brains' mineral content also contributes to its nutritional value. It serves as an especially rich source of selenium and copper. You need copper to help your cells produce energy, as well as to strengthen your connective tissues and maintain your immune system. As an antioxidant, selenium keeps your tissues healthy by preventing damage by toxic free radicals. Like copper, it also contributes to the health of your immune system. Each 4-ounce portion of beef brain boasts a copper content of 324 micrograms and a selenium content of 24 micrograms. This provides 44 percent of your daily recommended selenium intake and 36 percent of your recommended daily intake of copper. 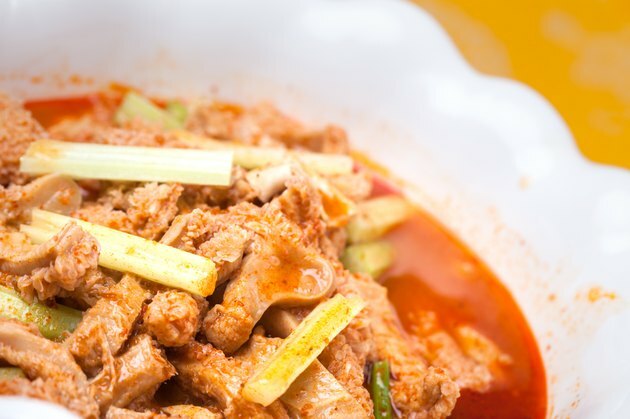 Beef brain also contains beneficial vitamins and serves as an especially good source of vitamins B-5 and B-12. The vitamin B-5 from your diet supports your metabolism, helps you convert food into energy and plays a role in hormone production. Vitamin B-12 helps you synthesize DNA, plays a role in nervous system health and supports new red blood cell development. A portion of beef brain contains 2.3 milligrams of B-5, or pantothenic acid -- 46 percent of your recommended daily intake. It also provides 11 micrograms of vitamin B-12 -- more than your entire daily B-12 requirement. While beef brain has some nutritional value, it also carries some serious health risks. Beef brain that is infected with bovine spongiform encephalitis -- more commonly known as "mad cow disease" -- can pose a serious health risk and cause Creutzfeldt-Jakob disease, a deadly neurodegenerative disorder. Beef brain also comes loaded with cholesterol. A single serving contains 3,401 milligrams of cholesterol, or more than 10 times the recommended daily limit, according to National Cholesterol Education Program. Cholesterol from your diet can raise the levels of harmful cholesterol in your bloodstream, especially in people sensitive to dietary cholesterol, so consuming high-cholesterol foods, like beef brain, regularly might negatively affect your health.